Buies Creek – Campbell has announced a new field design for Barker-Lane Stadium, home of the Fighting Camels’ football and women’s lacrosse programs. The new AstroTurf surface will feature orange end zones featuring white script reading “Campbell” and “Camels”. The field’s yard markers will also be accented in orange. At midfield, a silhouette of North Carolina, spanning 20 yards, will contain the Campbell Athletics logo. 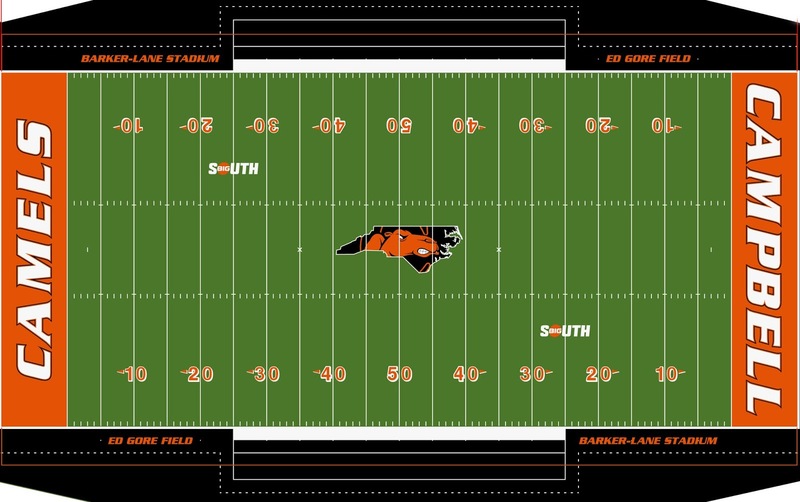 The Big South Conference logo will also be displayed at each 25-yard line. 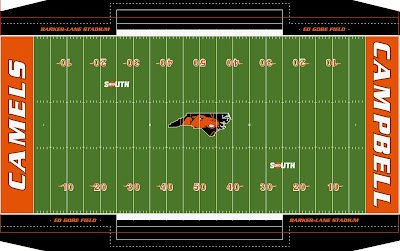 The playing field will be bordered in black turf, with orange markers for “Barker-Lane Stadium” and “Ed Gore Field” located beyond the sidelines. The project is set to be completed before the Campbell football team opens its 2018 fall camp. The new playing surface is the latest in a long line of improvements to the facility, which saw the installation of a state-of-the-art high-definition Daktronics video board just beyond the north end zone prior to the 2016 season. The screen boasts a 24'-7 " height and 42'-4" width. In January 2015, the Burt Family Sports Performance Center opened. The nearly 6,000 square foot facility, located in the southeast corner of Barker-Lane Stadium, provides a second strength and conditioning home (the other located inside the John W. Pope Jr. Convocation Center) for several Camel programs. Carlie C's IGA Hometown Proud Press Tower and west stands were completed in 2013, helping expand the stadium’s seating capacity to 5,500. Lights were added prior to the 2012 football season. Ground-breaking ceremonies for the stadium were held March 27, 2007, with the W. Irvin Warren Athletic Center and east stands being completed in 2008. Campbell hosted Birmingham-Southern on Aug. 30, 2008 in the inaugural football game at the facility, attended by a standing-room crowd of 5,845 fans. CU’s lacrosse program played its first game at Barker-Lane Stadium on February 23, 2013, defeating Kennesaw State 21-4. The Camels open the 2018 football season at Barker-Lane Stadium on August 30, hosting Chowan.